Dub Campaign is a quartet formed by long time friends and dub producers John Larsen (aka Righteous Dub) on bass and Justin Pietro (aka Dub Architect) on lead guitar, along with Chris Larsen (no relation to John) on vocals and guitar and Mike Lilburn on drums. The band embodies the DIY spirit and mentality, tracking and mixing the entire album entirely on their own in their home studio. When listening to “Lion in Disguise” one has to take into consideration the artistic value added by the production and effects, all done in house by Dub Architect and Righteous Dub. Just to add the cherry on top though, they worked with the renowned Lion and Fox studios for the albums mastering, adding just the right crispness to the tracks, like perfectly cooked bacon. Starting with a heavy guitar intro for the album’s title and opening track, the group takes listeners through several themes in the reggae genre, from deep delay effects in spacey dub breakdowns to screeching guitar solos over tight drum and bass tracks. Chris Larsen adds his powerful vocals with positive lyrics proclaiming, “Life is for the Music” in a track by the same name. Dub Campaign describes themselves as a musical movement, and their music certainly takes listeners on a journey both sonically and lyrically. On the track “Live for Today”, the band starts things out on a steady guitar and bass groove, then throughout the song they bring the vibe up and down until finally finishing on a heavy breakdown, which I’m sure pumps up the crowd during their live performances. The closing track of the EP, “I Require” is perhaps the most interesting to me, and probably the track that stands out the most. The band flawlessly balances a sound somewhere between reggae and latin rhythms, creating an intimate vibe on the track until the electric guitar kicks in reminding listeners these guys know how to rock. The band has only been around for a year, but if they can produce a great set of tracks like this in that short amount of time, expect some big things both live and in the studio. 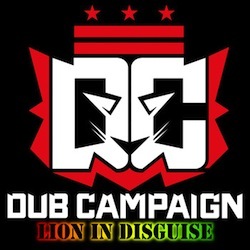 Join the Dub Campaign at www.DubCampaign.com.